Succumb to sweet (and smoky) temptation. 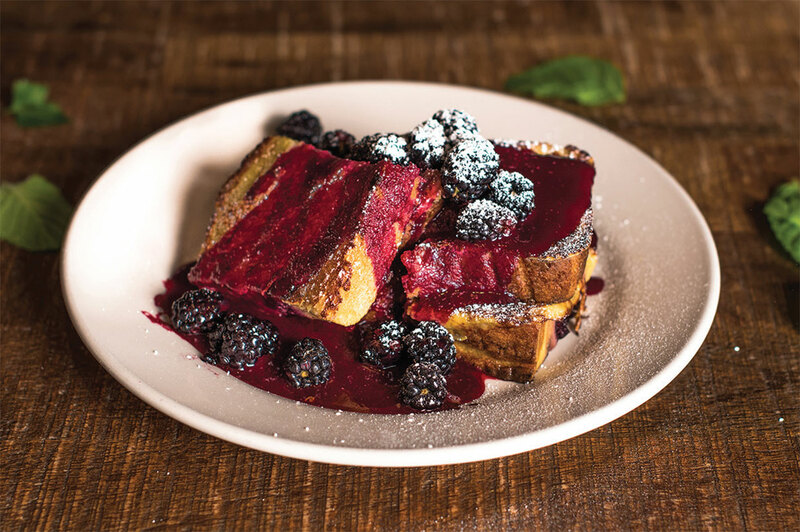 A berry good morning at Wilma & Frieda with Blackberry-Custard French Toast. Exotic. Comforting. Spicy as a mean red habanero. We all have ingredients we love (and loathe) and dishes we yearn to enjoy again, sometimes even before we leave the table. Food moves us. Our sensory-driven taste buds — and their recollections of outstanding meals — speak to us every time we ponder what to order. Great chefs know exactly how to rouse our palette's nostalgia and satiate those culinary longings. Palm Desert's beloved brunch spot draws a crowd even on weekdays. If the housemade English muffins and biscuits (with optional gravy) weren't reason enough to leave the diet at home and enjoy your morning, this bread puddinglike berry French toast should be. Those who fear a sugar crash favor the omelets, scrambles, sandwiches, and bennys, including the famed Short Ribs Eggs Benedict. A phenomenon at dark and lively Mastro's locations coast to coast, this cut is expertly seasoned and served on a sizzling plate, cooked as you desire. Post steak (and lobster mashed potatoes, prepared tableside), consider the melt-in-your-mouth Warm Butter Cake. Chef Engin Onural isn't afraid of Japanese fire. His signature roll: spicy tuna, cucumber, and gobo topped with salmon seared by a blowtorch, spicy aioli, and teriyaki sauce finished with microgreens and tobiko (flying fish Roe). Stay on the spice train with a Spicy Tuna Cocktail, the chef's version of tuna tartare served in a martini glass over refreshing cucumber salad with yuzu dressing and topped with a spicy tuna mix. Carnivores favor the half-dozen veal dishes at this cozy home of Italian classics. But meatless mains have a devout following too, from linguine with garlic and olive oil and an eggplant parmigiana to the housemade puttanesca — aromatic with tomato sauce, garlic, capers, black olives, and just a touch of anchovy. Beware the dessert cart, making its way toward your table with those velvety temptresses: cheesecake, crème brûlée, and tiramisu. As airy and comfortably modern as Hotel Paseo, in which it resides, AC3 likes to enliven the menu. For lunch, chef and owner Andrew Copley stacks a Kobe beef burger with smoked cheddar and melted onions. Add apple-smoked bacon and avocado. Pair with craft beer. Even in a desert known for sunshine and warm weather, this hearty traditional dish that marries a flaky crust with a creamy center of chicken and vegetables is ordered year-round. Regulars attest that the menu is so diverse they could eat here, well, daily. Many dine weekly, and mix it up with in Miso-Glazed Salmon, Trout Almondine, Meatloaf, and Fish and Chips. Served with tangy papaya-mango chutney, this jumbo shrimp appetizer with a light and sweet shredded-coconut coating gives the slightest crunch before the juicy bite of succulent shrimp. A tall slice of layered Piña Colada Cake lets you ride the tropical wave start to finish. 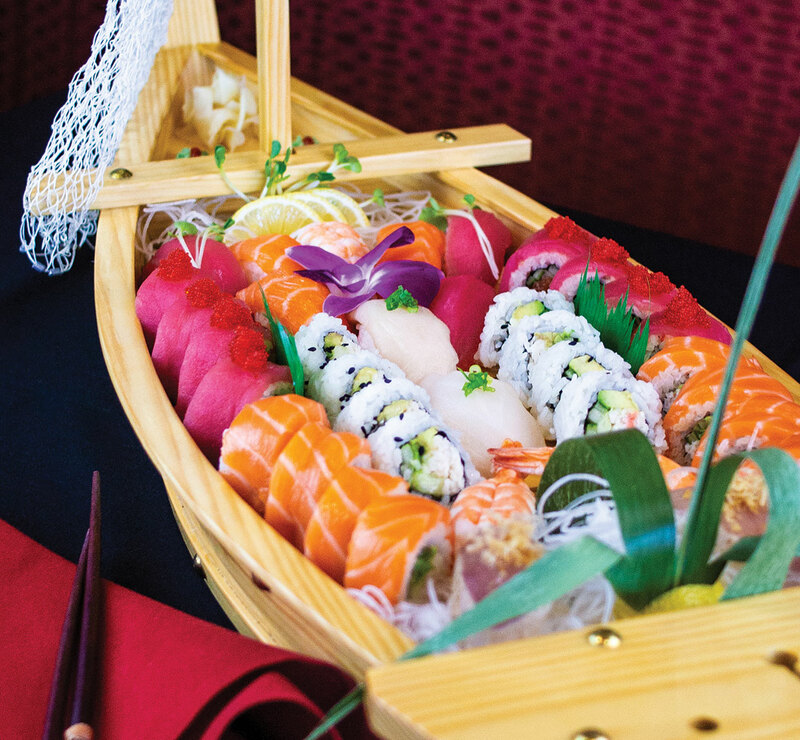 The Sushi Boat at Domo Sushi is perfect for sharing. The art of sushi meets the artful plating of master sushi chef Jin Young, a runner-up on the Food Network's Iron Chef series. Awaken your yen for fresh fish by sampling the Red Snapper Carpaccio or the Ahi Tower (tuna, crab, avocado, and wasabi) before moving to the main delights. Tuna, salmon, mango, and tobiko top the Domo Arigato rolls, generously sized gems of shrimp tempura, crab, spicy tuna, avocado, and cucumber. Celebrating? Order a sake flight and settle in for a pleasure cruise with the Domo Sushi Boat. This wooden ship made for sharing carries coveted cargo: Rainbow, Dancing shrimp, and Yummy rolls plus nigiri and sashimi. While French fare is the focus of this Parisian-style bistro, the long list of salads that strays beyond a timeless Niçoise features popular choices for a light lunch on the patio. Papaya slices swirl around the Chicken Curry Salad, a refreshing go-to for its warm flavor and protein boost. A restaurant known for personal service (Mitch himself often greets guests and ensures they feel well taken care of), Mitch's is equally renowned for its sushi, seafood, and steak. The menu is vast, filled with enticing preparations of both surf and turf. While you mull it over, the mini Wonton Tacos filled with diced ahi tuna, mango, sesame poke sauce, chuka salad, avocado, and wasabi aioli are a must. If they're not fixated on one of the chilled seafood selections, guests often drop their eyes to this section of the menu. The Classics are four chef's specialties: Sugar-Spiced Salmon, Mustard Catfish, Pan-Seared Chilean Sea Bass (with a honey-soy glaze, ginger sticky rice, bok choy, and green-curry-coconut sauce), and Seared Rare Ahi (with ginger-soy beurre blanc, gingered carrots, shiitake mushrooms, and ginger sticky rice). Indoor-outdoor seating is plentiful at this newly remodeled restaurant on the second level at The Gardens. An atmospheric departure for Palm Desert, this lofty space with rustic brick walls feels utterly Manhattan. Acquire Sicily's taste for the Black Ink Linguini, where mussels, clams, shrimp, and calamari mingle in tomato sauce. The Sea Bass, Swordfish, Ribeye, Seafood soup, and Tiramisu deserve mention as well. Whether regular or skinny, this 'rita is not for the faint of tequila. Locals and El Paseo merchants look forward to Armando's sassy, salted-rim signature.